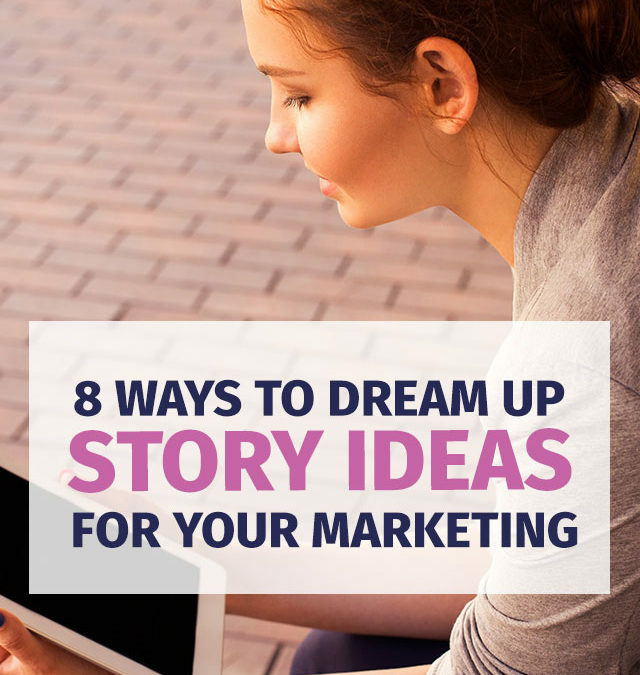 The tricky little question is, how do you come up with engaging stories to tell in your business? 1. How do YOU do business? Everybody does business differently — figure out what is compelling in your business, and tell us about it. Start by doing an inventory of your business. How does your pricing compare to your market — and why have you chosen this pricing? What products or services have you developed in response to your customers’ needs? Gary Vaynerchuck’s advice on content creation is to keep it simple. “Document, don’t create,” he says. He encourages people to walk around with their smartphone, and take pictures throughout their day. Use these pictures to tell the story of your business on your blog and across social media channels. 2. What content have you already created? I don’t know about you but I write a LOT of emails. Some of these emails explain to clients how to solve their problems, in a detailed, step-by-step manner. Whether you’re writing long emails, or having conversations with people, there are things you probably explain over and over in your business. If you could write these things out as blog posts, you could tell customers to check it out on your blog. You could share the blog post across social media channels to attract people to your business as well. Maybe you’ve also got brochures, sales presentations, a script from a speech, some Facebook Live videos — do an inventory of all the pieces you’ve already created and see which ones would make great content for your blog and social media. One of the most effective ways to use content is to create pieces that help clients get what they need in different phases of your Sales Process. (For the client, this is their “Buyer’s Journey.”) What sort of information can you create that would introduce your solution, provide additional information, compare your product to other solutions on the market, or prove that your product is the best solution for a potential client’s problems? We do this effectively for our clients by creating info-sheets and downloadable guides on their websites. Those sales pieces bring real leads in the door on an ongoing basis. TIP: You may find that creating an FAQ page for your company is a great place to start — providing the answers to all the questions people regularly ask about your product or service. What sort of content could you create that would make your readers excited to find your website and share it with others. Can you answer all their questions about a particular topic? Can you create checklists and plans they can use in their lives? What would make your website the best place to inform, inspire or entertain your readers? Making an emotional connection can elevate your content from average to exceptional. Connecting emotionally with readers requires being “real” in your content. This is why we often hear the advice, “write what you are passionate about.” Figure out what your brand’s values are and take a stand. Think about the parts of your business you are most proud of, or most excited about. Write what you care about — especially when it lines up with what your customers care about as well. Create heartfelt content around issues that your readers care about, and you’ll find likes, shares and engagement skyrocket. Remember those great stories you wish you had thought of first? Start keeping track of them and you’ll find that you start coming up with ideas, too. With my content marketing students, I create a spreadsheet for tracking at least 10 – 20 people who are telling good stories, or creating engaging content, in their industry or local area. You can learn a lot from watching what others are doing. See how they share similar content across different platforms. Track down all the places they are showing up — both online and offline. Sign up for their email lists and freebies, read their blogs and listen to their podcasts. Then, figure out how you want to fit into this landscape. I don’t advocate making your content all about keywords, just to attract search engine results. It’s far more important to provide great content for real people to read. However, Search Engine Optimization (SEO) can drive a lot of potential customers to your website. SEO is one very powerful tool in your marketing toolbox, so it’s important to include it in your strategy. Instead of thinking of your content as a finished piece, try to think of it as the beginning of a conversation. Paying attention to the response you get will help you come up with more ideas as you go. Give it a whirl. Once you start coming up with ideas using these 8 strategies, you’ll find that you see things a little differently in your business. Try to keep track of your content ideas as you go, and take the time to develop an idea at least once a week. It’s a bit like building strength in a muscle — you’ll find yourself more and more creative and adept at coming up with new ideas as you go. To get my ideas on a weekly basis, be sure to sign up for my Monday Morning Strategy notes in the sidebar.